NYX Slip Tease Lip Lacquer ($7.99) is a new glossy, pigmented lipgloss not to be confused with NYX Slip Tease Full Color Lip Oil that recently launched for Summer 2018 in twenty-four shade selections. I don’t know about you but I did do a mental eye roll when I saw NYX coming out with yet another lip product. At this point I do question if they actually do any other products aside from liquid lipstick and lipgloss. I admit I’m so turned off by the endless round of lipsticks and lipglosses that I didn’t jump right on Strictly Vinyl Lipgloss when it launched when typically I would. I ended up picking it up on a whim when I hit up Ulta a few weeks ago and I’m proud to say I only got one shade as I really didn’t feel inclined to have yet another NYX lip product with a formula I already own just with a different name. Here’s how things went down with this formula! If you’re headed in for a purchase I’d totally skip NYX Slip Tease Lip Lacquer and just go with NYX Strictly Vinyl Lipgloss if you’re wanting a lighter, glossier formula. This isn’t to say Slip Tease Lacquer was bad I just preferred Strictly Vinyl’s lighter texture for Summer looks where as Slip Tease Lip Lacquer will prove nicer in the Fall months. Keep in mind last year, Slip Tease Full Color Lip Oil launched and that could be confusing since this product shares the same name but the textures and formulas are quite different. Slip Tease Lip Lacquer arrives in a octagon-shaped barrel with a gunmetal cap that can be engraved for an extra two dollars if you purchase it from NYX’s website. The package has a weighty feel to it and looks quite elegant and not as bulky nor as cheap as some of NYX’s lip product’s packaging. It has an hourglass applicator which I find a little weird to use at first but quickly adapted to and really started to love as I can use the middle part to swipe color on my lips while the tip is perfect for lining my lips. I only purchased one shade but I can actually see myself headed in for more as the formula is really good. NYX is an odd bird at times as they’ll create a lip product that completely hits the mark and within a space of a few weeks launch something else that totally misses it. This definitely hits a sweet spot. I’m not sure I’d go so far as to classify it a lipgloss as it has a more hybrid formula that’s part lipstick and part lipgloss. The pigment is intense, rich, and opaque on a single application with a long, strong wear of six plus hours. It has a nice shine initially but this wears away a bit after about two hours. I had no issues with feathering nor migration but the color did fall a bit into my natural lip lines but nothing that looked too bad. The texture is quite thick and creamy with a crisp, cool peppermint flavor and fragrance that I thought was very pleasant. 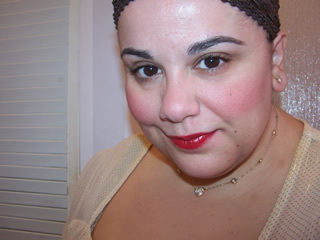 All in all, NYX Slip Tease Lip Lacquer proved quite a nice hybrid lip product that wears comfortably and long. It’s worth picking up a shade or two to try out for yourself! NYX Slip Tease Lip Lacquer is available in twenty four shade selections for $6.99 each and is 0.10 oz in size. This a hybrid formula that has the shine of a gloss but the pigment and longer wear of a lipstick. I thought the texture was thick, creamy, and easy to apply with color falling into my natural lip lines a little bit but not migration or feathering issues. The formula wore for six plus hours and provided opaque color on a single swipe with a very comfortable to wear formula that had a shiny finish for the initial two hours of wear. Ideal for anyone who’s tired of long-wearing lipsticks but wants the pigment and wear of one without the matte, dry feel. Minor issues with color falling into natural lip lines giving the product a less than smooth appearance. Anyone who veers away from long-wearing liquid lipstick because they find it to dry or matte should love this formula. It’s creamy, very lightly hydrating, has incredible pigmentation, and provides a very long wear without the matte, dry feel of a traditional long-wearing formula.